Many believe that the Olympic platform is used as a mechanism for expressing political and ideological authority on the world stage. Throughout the history of the modern Olympic Games, powerful political forces have utilized the headline-grabbing event to express opinions and demonstrate strength. Regardless of whether you subscribe to this theory that political entities utilize the Olympics as a device to channel hegemonic ambitions, it’s unquestionably fascinating to analyze the fortunes of East and West at the modern Summer Games. And, what better way to do that than to track the fortunes of Soviet Union, Russian, Chinese (PRC) and American athletes at the Games over time. Throughout the history of the Summer Games (1896 – 2008), the USA has been a dominant force, winning 936 Gold medals, or 61 pecent of the total Gold medals won between itself, the Soviet Union and China. America secured a Gold medal in the inaugural Summer Games, when its first ever Olympic athlete, Thomas Burke, won both the 100 and 400 meter sprints at Athens in 1896. In fact, the USA has a decorated history of Olympic success, and is widely regarded as the most successful Olympic nation, having won more Gold and total medals than any other country at the Summer Games. Prior to London 2012, American athletes have taken home 2298 medals at the Summer Olympics. The USA has also hosted the Summer Games on four occasions (St. Louis in 1904, Los Angeles in 1932 and 1984, Atlanta in 1996). It has also hosted the Winter Games four times. Since the 1960 Summer Olympics of the XVII Olympiad (held in Rome, Italy), there’s been a clear upwards trend in the number of countries that have claimed Gold medals compared to super nations America, the Soviet Union and China. 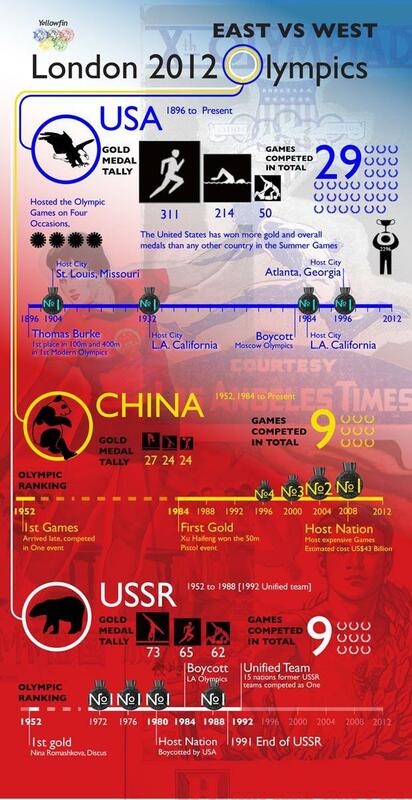 In 1960, countries excluding USA, USSR and China won a total of 75 Gold medals. At the 2004 Athens Olympics, countries outside the aforementioned power three won 206 Gold medals. In one of our previous blog post – Assessing the diversification of medal winners by nationality at the Olympic Games – we also discovered that the number of distinct nations to have secured at least one Gold medal at Olympic competition at the Summer Games has risen steeply in recent decades. In 1960, just 44 different countries won at least one Gold medal. In Beijing (2008), 85 separate nations celebrated at least one Gold medal performance. Aside from the diversification of medal winners by nationality (as a global trend), some other trends are immediately apparent. The USA has been a consistently dominant force throughout the history of the modern Olympics. America has participated in – and won Gold at – every modern Olympics (Summer and Winter), with the exception of Moscow’s 1980 Summer Games in which it led a 65 nation strong boycott. Conversely, the Soviet Union didn’t win any Gold medals until the 1952 Summer Games, with China not registering an Olympic triumph until 1984. However, both nations have been consistently strong performers since their breakthrough victories. So what changed? Well, with the help of some history books, the answer is obvious. Both China and the Soviet Union have had shorter, and more interrupted, Summer Games careers. In reality, they have also been consistently strong performers at the Summer Olympics in which they have attended. Like China, the Soviet Union (USSR) made its Summer Games debut at Helsinki in 1952. Nina Romashkova won the Soviet’s first Gold medal in the women’s discuss with a then Olympic record throw of 51.42 meters. The USSR hosted the Olympic Summer Games once (Moscow, 1980). However, the 1980 Games were fraught with controversy, with a total of 65 nations contributing to a US-led boycott of the Games of the XXII Olympiad. Subsequently, the Soviet Union led a retaliatory boycott of the 1984 Los Angeles Games, which included 14 Eastern Bloc nations as well as Cuba and East Germany. This explains why the Soviet Union did not win a Gold medal in the ’84 Games. Curiously, this did not stop fellow socialist nation, China, from making its long awaited return to the Olympic fold. With the dismantling of the USSR in 1991, 1988 was also the last Olympics at which the Soviet Union competed. For more on the impact of Olympic boycotts on the diversification of Olympic medal winners by nationality, check out our previous data blog, Assessing the diversification of medal winners by nationality at the Olympic Games. Note: the discrepancies between the USSR’s placings in the overall Summer Games medal table compared to the its placing regarding its total number of medals won at each of the Olympics in which it participated. This is due to the Olympic medal table being weighted in favor of Gold, rather than total, medal counts. So now we understand the reasons underpinning the spread of Gold medals accumulated by the USA, Soviet Union and China over time. But, in which sports did each super nation dominate? Each current, former and rising Olympic power enjoyed notable dominance in a number of standout sporting categories. So what’s the reason for this concentration in success by event category? Are brilliant individuals responsible? There appears to be a strong correlation between highly successful event categories, and highly successful individual athletes (those who have won ten or more medals). The USA has strong pedigree in Track and Field and Swimming, with household names like Carl Lewis (Track and Field), Mark Spitz (Swimming) and Michael Phelps (Swimming) holding prominent positions on their all-time individual medal leaderboard. Likewise, individual athletes from the Soviet Union have experienced greatest success in their most dominant event category of Gymnastics (Polina Astakhova, Larisa Latynina, Viktor Chukarin, etc). Not one Chinese athlete has won 10 or more medals. This is most probably due to their shorter history at the Olympics. Interestingly, it seems that one possible explanation for America’s longevity – in terms of dominance – at the Summer Games is its ability to prolong the Olympic careers of its best performers. Seventeen American athletes have won at least one medal at four or more Summer Games, the USSR 13, and China just two. Russia – as opposed to the USSR – has competed at seven Summer Games, excluding London 2012 (1900, 1908, 1912, 1996, 2000, 2004, 2008). The 1917 Russian revolution, the consequent destabilization and the subsequent establishment of the Soviet Union in 1922, meant that Russia did not compete as a single nation from the 1912 Games until Atlanta in 1996. Notwithstanding the disbandment of the USSR in 1991, 12 of the 15 states that formed the former Soviet Union competed as a single Unified Team at the 1992 Barcelona Games, finishing first in the medal rankings.